Fifth Avenue in Bankers Hill is currently undergoing a high-rise condominium building boom, destined to place this neighborhood firmly in the high rent category. Seemingly in sync with these developments, a contemporary fine dining restaurant and bar venture called Avenue 5 recently opened its doors in this newly burgeoning enclave. The brain child of local Uni High alum chums Chef & Proprietor Colin MacLaggan (Arterra, Bertrand at Mister A's, Mille Fleurs, Ole Madrid) and General Manager Nicolas Carbonne (Tapenade, Pasquale, Dakota Grill, Ole Madrid), Avenue 5 is the end product of a shared vision that has been fine-tuned throughout both of their professional lives. 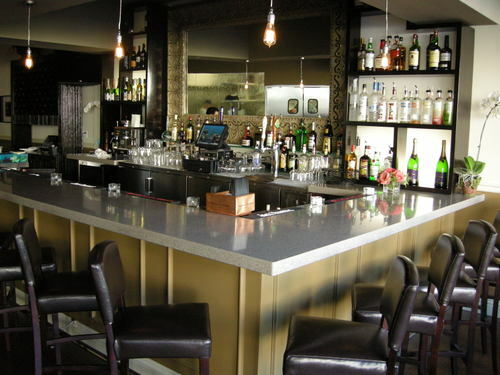 and a well-appointed upscale bar, showcasing an immense antique mirror. 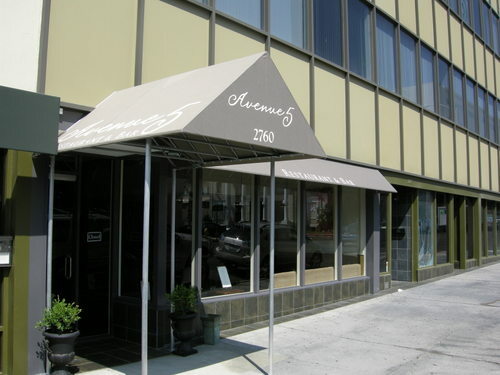 Avenue 5 features a seasonal menu, offering French-inspired American cuisine. Dining options include ordering individual items a la carte, or indulging in a five course tasting menu ($70) with optional wine pairings (+$30) selected by Mr. Carbonne. I had the latter with wine pairings, plus an additional appetizer to be described later. 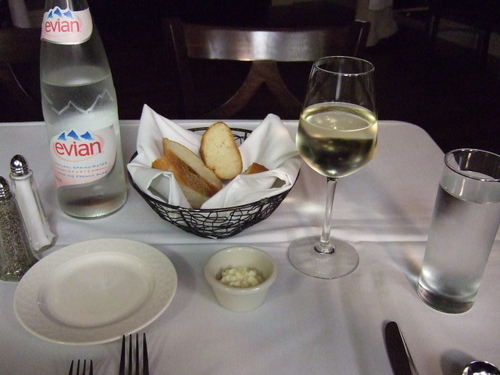 The initial table setup features Bread & Cie French baguette slices, butter, Evian water, and in my case, the first wine pairing. My tasting menu began with Pesce Alle Erbe Aromatiche (Marinated Tuna in Aromatic Herbs, with Heirloom Tomatoes and Infused Oils). Wine Pairing: Sauvignon Republic Cellars 2005 Sauvignon Blanc, Russian River Valley. The presentation of this appetizer was stunningly attractive. The infused oils were curry, parsley, and red bell pepper. All were nicely flavored, but the curry proved most dominant. 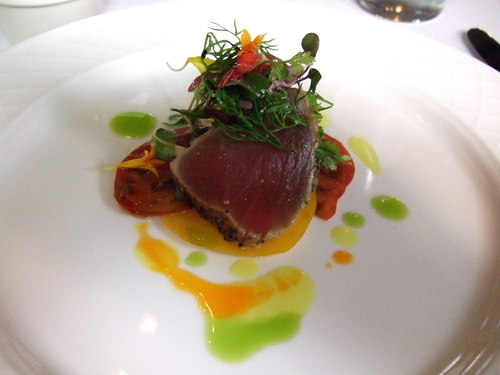 The tuna was ultra-fresh, and the tomatoes were peak of summer super sweet. All in all, this was a refreshing summer starter. 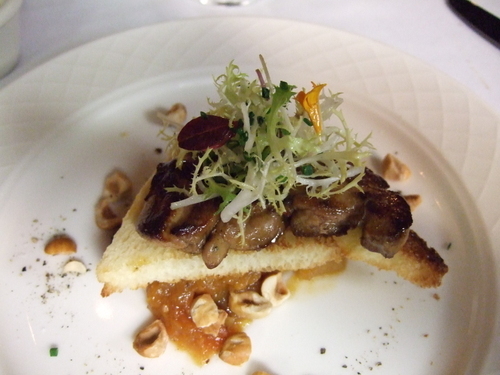 Next came Seared Foie Gras with Pear Chutney, Hazelnuts, and a Sauternes Honey Reduction Drizzle. Wine Pairing: Royal Tokaji 2000, Hungary. Those of you that are regular readers know of my penchant for foie gras, and this succulent rendition satisfied me on every level. What stole the show however, was the accompanying chutney. Chef MacLaggan's house-made version has large chunks of fresh pear, along with a bright, tart, and slightly sweet flavor profile. All this is accomplished while managing to avoid that cloyingly sugar-syrupy component, often present in East Indian style chutneys. I can tell you in all earnest that this extremely fresh chutney has ruined all others for me. The resplendently rich Hudson Valley foie gras, roasted hazelnuts, and this amazing chutney make for an appetizer that is a must for all you duck and goose liver fans. 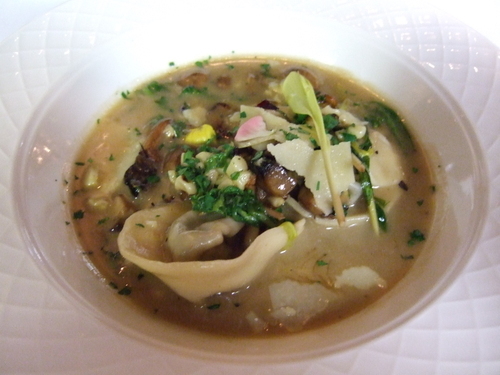 My additional appetizer was Wild Mushroom Tortellini with Grilled Sweet Corn, Champagne Grapes, and Madeira Broth (+$9). Wine Pairing: Mark West Winery 2006 Pinot Noir, Sonoma Coast. Chef MacLaggan prepares the tortellini by hand every day. The pasta has a perfect toothsome texture, and the filling of portobello and chanterelle mushrooms bound with marscapone cheese has a rich, earthy flavor. The tortellini bask in a luxurious Madeira-cream broth with sweet corn tops, champagne grapes, mushrooms, and shaved parmesano reggiano. Enjoyed all together, this offering was almost sensory overload, and when I was finished there was only my reflection left in the bowl. 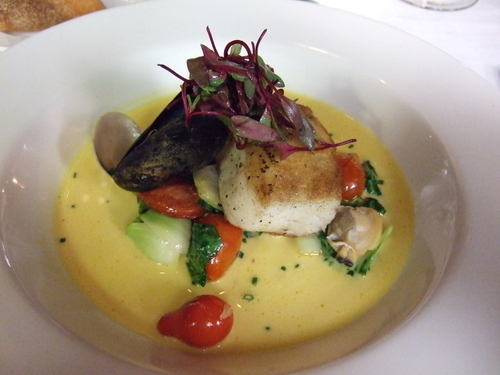 The entree fish course was Alaskan Halibut, Fricassee of Mussels, Clams, and Chorizo, on a bed of Bok Choy, in a Saffron Essence Stock. Wine Pairing: Silverado 2005 Chardonnay, Napa Valley. Halibut is an unforgiving fish to prepare, as it can progress from undercooked to perfect to dried out in less than two minutes. My fillet was spot on, and had a well developed golden brown crust which yielded to the moist and tender interior of the large-grained flesh. The fresh mussels and clams, along with the zesty chorizo, added an original character to this entree. The coup de grace was the saffron enhanced stock reduction with its full-bodied complexity, derived from a scratch-made aromatic fish fumet base. The reduction was so good that, once again, I cleaned my plate (a re-occurring theme for me at Avenue 5). I would not hesitate to order this entree again. 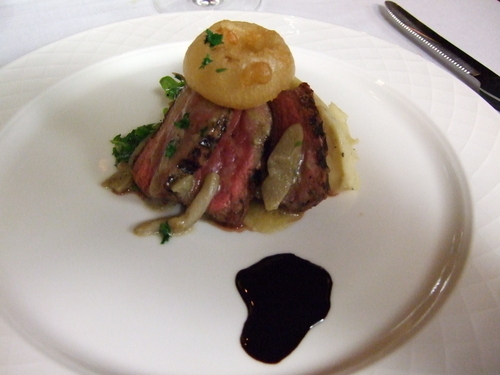 The fish was followed by New York Steak with Creme Fraiche Potato Puree, Onion Ring, Baby Arugula, Port Balsamic reduction, and a Porcini Vinaigrette. Wine Pairing: Tempranillo 2003 Riviola, Spain. 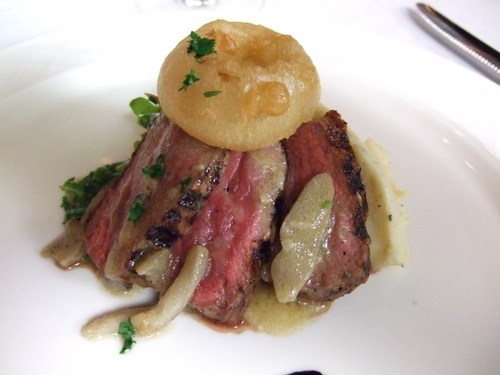 A closer look at the steak and onion ring. Chef MacLaggan said he chose this "superior [baseball] cut" New York because of its flavorful, inherent fat ribbons, apparent in the slice below. I liked everything about this offering. Artistic plating, amazing beer battered onion ring (Chef, can I get two dozen to go?) smooth, rich potatoes, and tender, flavorful, perfectly sauced meat. If you are a beef-eater, do not miss out on this course. It turns out that Chef MacLaggan is also a trained pastry chef, and calling his creation "cheesecake" doesn't do it justice. Starting with a creme anglaise pooled in the bottom of a deep plate, he forms a base crust of pate sucree topped with a layer of caramelized pears. For the next level, goat cheese, cream cheese, sour cream, and lemon juice are combined and baked, causing the mixture to set. 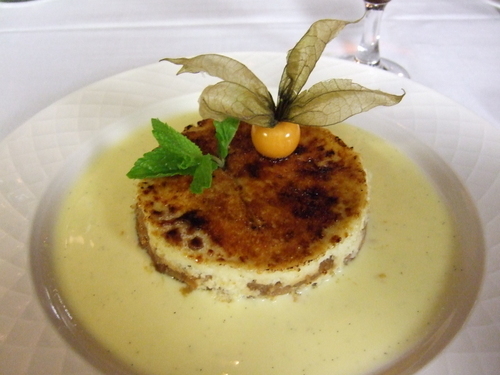 Finally, the top is bruleed, and then garnished with a sprig of mint and an Argentine gooseberry. The different textures and flavors made for a great dessert. Chef MacLaggan hit this one out of the park. In keeping with their precepts, Chef MacLaggan and Mr. Carbonne have seen to it that Avenue 5 is devoid of the usual restaurant supply products found in many other establishments. This fact was made abundantly clear when, during a tour of the kitchen, Chef MacLaggan pointed out his modestly sized freezer and quipped "I don't keep much in there." This subtle but telling statement adroitly conveys an aspect which I love about this restaurant. Everything at Avenue 5 is ultra-fresh and made from scratch on a daily basis. Avenue 5 has all the bases covered. 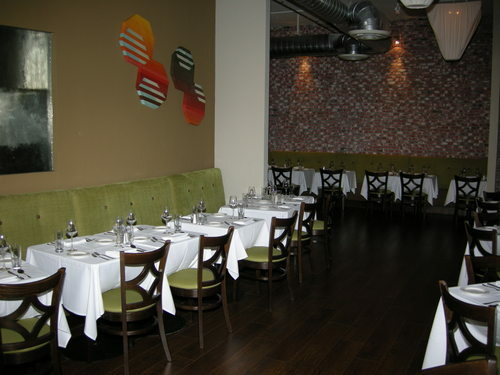 The dining environment is tasteful, attractive, and svelte. Chef MacLaggan's kitchen produces inspired and delicious offerings, blending gorgeous presentations with complex flavor and textural interactions. Service is adeptly supervised by hospitality guru Nick Carbonne. In pooling their talents, experience, and passions, Colin MacLaggan and Nick Carbonne have brought their shared vision for Avenue 5 to fruition. The resulting dining experience is one that should not be missed. I think the same developer has started high rise construction in Irvine. Here's to hoping good eats like these follow. Interesting choice of a Cali Pinot Noir to pair with a Mushroom dish..
wonder what inspired that.. i expected a nice burgundy. How is their wine selection there? Jack you are the Hemingway of foodie writers. Nice story and pics. And any place that still has foie gras on he menu is a Place I have to try. As I am addicted to that stuff as well! Hey CJ - Sooo good you went back for more, huh? GM Nick Carbonne handles the wine pairings for Avenue 5. I am sure he would be happy to explain his logic to you. As far as the second part of your question, that is rather subjective. I liked it a lot, but you should swing by and check it out for yourself. You are too kind. 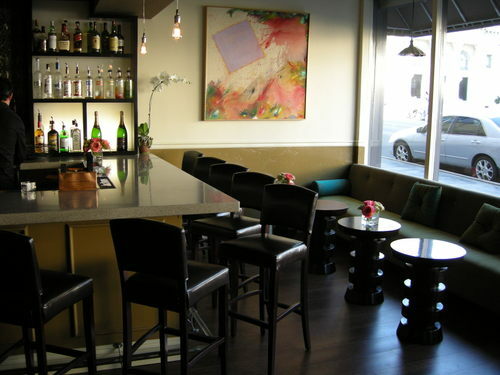 The foie gras was excellent, you surely should give A5 a try. What a marvelous post with great photos of the dishes! Looks like a nice place to go for a special occasion. That steak and onion ring especially looks tempting. Thank you so much. 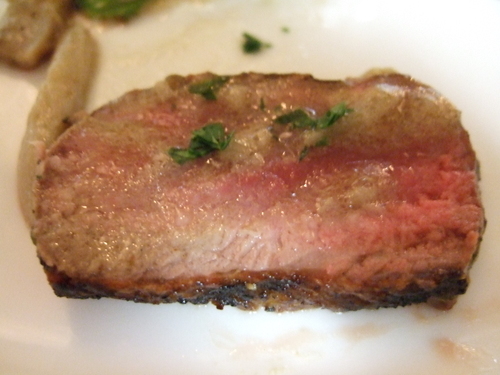 The New York steak was excellent, I think you would really like it. Great blog you got here! I've only recently begun exploring San Diego and you've provided some real winners. Keep 'em coming, Captain! I'm looking forward to the next post. + a salute to a fellow UCSD alum. Thank you very much and thanks for stopping by. It really was an excellent meal. after receiving the "Happy Hour" menu at the table from the woman seating people and giving our order to the waiter from the "Happy Hour" menu while sitting at the table and holding it our hands...we were charged the regular (huge) prices...when protesting to the manager, his comment was that we couldn't have ordered from that menu because that is only for people sitting at the bar ! Perhaps he should so inform his staff so they can inform the customers. He adamently insisted we pay the full price which we did only because we were trying to get to a theater performance. He said as we left, "Thanks for being so understanding. Next time you come, be sure to see me and I'll do something nice for you." I hope he is holding his breath. What an example of how not to run a restaurant and improve customer relations. What wonderful photos. I've been fiddling with my own camera and I can't seem to capture photos that look nearly as great as what I'm looking at and eventually eatting. Any suggestions? Thank You for your kind words. Hang in there, practice makes perfect. This was the worst restaurant experience of my life. When we arrived, a waitress asked if we wanted to sit near the bar or in the back area. We said the back and followed her. The Maitre D (Nick) had menus in his hand and I asked him which table we were to get. He said “you don’t have a reservation and you don’t get a table.” The place was about 90% empty and remained that way for the entire evening. He seated us at a table in front of the window, my guess to make the place look busier that it was. Upon leaving I told him that were unhappy with his attitude and to watch for my review online. While the food and décor were very nice, there are other restaurants in Bankers’ Hill who know how to treat customers.